Cutting-edge strategies, data, and techniques from the world’s foremost ePhilanthropy experts. Giving donors the chance to participate in and contribute to the success of a charity beyond the online gift is proving to be successful for many nonprofits. 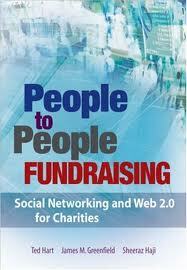 Find out how to make the most of your online fundraising efforts with the expert advice found in People to People Fundraising: Social Networking and Web 2.0 for Charities. Based on the authors‘ decades of combined real-life experiences plus scores of international case studies demonstrating ePhilanthropy success stories from around the world, People to People Fundraising provides a wealth of proven, practical techniques to help you boost your organization’s success.